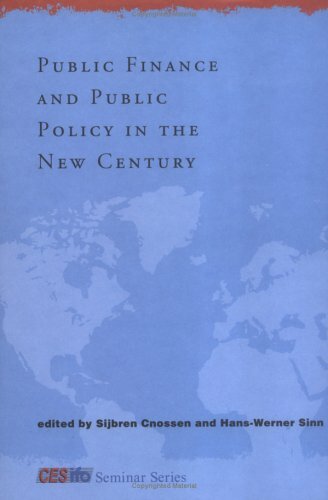 [PDF] Public Finance and Public Policy in the New Century (CESifo Seminar Series) | Free eBooks Download - EBOOKEE! Description: The sixteen essays in this book were written to celebrate the ninetieth birthday of Richard Musgrave and to commemorate the tenth anniversary of CES, the Center for Economic Studies at the University of Munich. Musgrave is considered to be a founding father of modern public economics. He belongs to the intellectual tradition that views government as an instrument that can be used to correct market failure and to establish the society that people want. Although his work fits within the individualistic framework of modern economics, he also draws on principles of moral philosophy.The essays take stock of and extend the theory and practice of public finance and public policy. They address the evolving role of government and the welfare state, the interaction between taxation and markets, the future of pension and health care systems, and international tax issues and fiscal federalism. 2018-01-08[PDF] Whither Turbulence and Big Data in the 21st Century? No comments for "[PDF] Public Finance and Public Policy in the New Century (CESifo Seminar Series)".